A recent addition to Bath’s leisure offering, the Tivoli boutique cinema joins an array of retail and gastronomic units at the city’s new SouthGate district, including top brands such as Apple, Hotel Chocolat and Urban Outfitters. 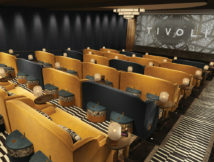 London-based design consultancy Run For The Hills were approached by the client, Tivoli Cinemas, whose ambition was not only to create a premium cinema, dining and cafe experience, but also to sculpt the Tivoli brand from the ground up. Part of Tivoli’s USP is that the interior design including curation of bespoke fittings and artwork plays a key role in the experience. It is Run For The Hills’ first cinema, the client selecting its designers on the strength of their hospitality design portfolio, which includes a number of restaurants and bars. Justin Ribbons, Tivoli Cinemas’ CEO, was also swayed by the integrated approach the firm offered. He explains: “We liked the fact they do both branding and interiors, so we got to work with just one design shop to create a seamless new brand identity and in-venue look, from the decorative scheme to the design of the menu, signage and ad campaign.” Despite the market for boutique cinemas being a mature one, the offering from competitors is relatively well defined and homogenous. For example, at the premium end sits Electric Cinemas from the Soho House Group, and in the mid-range are the Everymans and the Curzon cinemas. 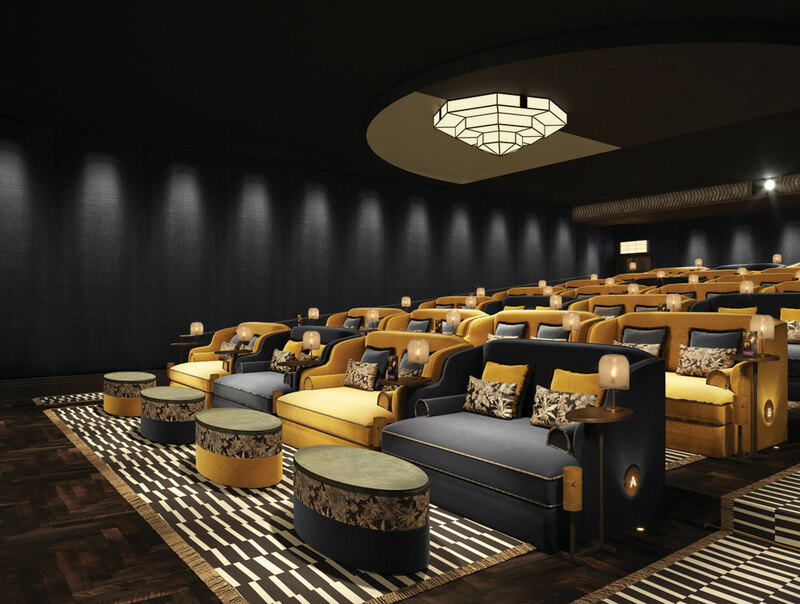 In terms of Tivoli’s interior design, both client and Run For The Hills (working with cinema specialist architect Unick Consulting) wanted to create something fresh for the cinema scene which sat somewhere between high-end and mid-range. 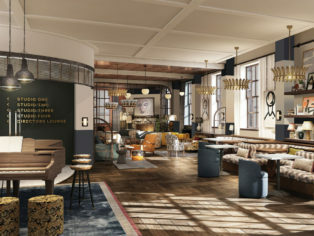 The resulting brief emphasised pushing the boundaries of what can be expected in boutique cinema design and hospitality design, especially outside of London. Anna Burles, creative director and co-founder of Run For The Hills explains: “We eventually found a place in the middle, with a creative design that reflects the breadth of audiences that cinema attracts.” Prior to Tivoli Cinemas’ arrival on site, the venue (a neo-Georgian building designed by Chapman Taylor as part of the wider SouthGate retail scheme completed in 2010) housed a large fast-food unit. This meant that a considerable amount of work had to be done to renovate the interior spaces and provide amenities that the client demanded. The early stages of general arrangement planning went through multiple rounds of CAD, with the architects focusing on the technical planning of the seating arrangements in the studios and screening rooms, while Run For The Hills concentrated on the concept and spatial configuration of the hospitality areas and public spaces. 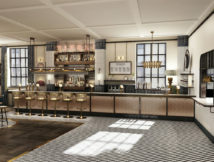 These included the entrance, concierge, corridors, stairwells, cocktail bar, design of the kitchen pass, bathrooms, café, lounge and main restaurant space. The exterior of the building is completed by a large, retro-styled ‘Now Showing’ screen within a blackened steel ‘crittall’ frame, accompanied by subtly backlit lettering. Visitors are beckoned in through an oversized and dark door opening into a concierge-style lobby – the space is “very moody and dark, exuding a premium feel,” explains Burles. The entrance is dressed with light fittings and softly illuminated decorative signage. A mesh and brass framed staircase takes users up to the first floor open-plan hospitality area. Upon entering the main leisure space, users encounter the bar, beyond which the cafe and lounge areas are adjacently situated, forming intuitively located zones. Run For the Hills designed crittall-style room dividers for flexible sub-division of the pillared open plan space, along with all-new doors, wall panelling and a picture rail running the entire perimeter, from which curtains and art are suspended. The main cocktail bar is one of the biggest new constructions, with a ceiling-suspended metal gantry and custom lighting. The Tivoli logo is displayed across a large back-bar joinery piece – also designed bespoke – with an integrated antique mirror. Located at the far end of the space is a more formal restaurant area – the entrance to which is framed by further curved ‘urban-deco’ crittall screens that divide the space without closing it off completely. Behind the screens hang full-height drapes, giving users the option for more intimate private dining and events, and maximum flexibility for either private or public use. Curved sofas were designed with couples in mind. New walls and partitions were erected to cordon off each of the four screening rooms plus the exclusive ‘Director’s Lounge,’ while the bathrooms are situated more or less in the pre-existing locations, having undergone some minor tweaks in layout. Kitchens and back-of-house amenities were repositioned for enhanced functional performance. In the early stages of the design, Run For The Hills experimented with bespoke stoneware pieces and detailing, as Burles explains: “We were really inspired by the beauty of Bath as a location and the history and materials that come with it.” The designers played with the idea of using Bath and York stone to reference the location, but then decided against it as the building itself, with its neo-Georgian architecture, was seen by the team to pay sufficient homage to the local context. “We didn’t want to veer into cliché in any way,” says Burles. Also, as in all projects, budgetary restraints placed limits on design freedom. A bespoke mosaic floor in front of the cocktail bar was considered – nodding again to the city of Bath – but the prospect of future venues and the nature of the material made it, in Burles’ words, “a tricky concept to future-proof.” Tivoli’s colour palette is earthy and warm, including rich golds, green, ochre and dusky blue tones, in linens, velvets and deep-textured weaves. In terms of materials choices, chalky and marbled stones offer tactile finishes and are paired with a strong mix of patinated metals including bronze, brass and blackened steel. “We wanted to create a journey with the interior design, materials and finishes, and the lighting,” explains Burles. “We worked really hard on the lighting as that can not only elevate the design but also seriously enhance the user experience – getting customers in the mood and encouraging ‘dwell time’ within the space,” comments Burles. “Lighting also ties in key spaces that otherwise are quite far apart and could feel quite disconnected from each other.” The lighting scheme is a mix of off-the-shelf luminaires and fully bespoke, Run For The Hills-designed larger key pieces, all intended to balance each other both stylistically and in terms of materials. Burles explains: “We’ve mixed metals over modern chandeliers, nodded to the natural world with leaf and petal designs, and contrasted these with urban black steel and tube lamps to create pockets of space that balance old and new design ideas.” Run For The Hills worked closely with architectural lighting consultant Elektra Lighting to create ‘fluid’ lighting throughout the cinema’s spaces. This included ensuring the correct lux levels via specifying the correct numbers of lamps, and rationalising the placement of ambient background lighting. Elektra Lighting also developed technical lighting details for the many bespoke joinery pieces Run For the Hills designed, including a faceted, crittall-style bulkhead at the entrance to the screening rooms, and the custom mesh and metal staircase. A significant part of their role was to marry the ‘colour temperature’ across wall and ceiling pendants and also across the kitchen lighting and back of house, specifying the bulbs and fixtures to complement other decorative fittings. Important in the cinema experience, this also served to prevent any sudden bursts of white light when any back-of-house doors or hatches are opened. Since Tivoli is an all-day venue, one of the challenges for the designers was the appropriate treatment of light throughout the project, given fluctuations in daylight levels across the cinema’s opening times. In the day, oversized Georgian lattice windows cast streams of sunlight and long shadows onto the herringbone-patterned oak floor. After sunset, atmospheric lighting adds to the buzz around the bar area while soft pools of light serve to further zone the seating and dining areas. Lighting in the corridors drops to create a sense of excitement when heading into the ‘studios’ to watch a film, provoking a sense of anticipation in customers. 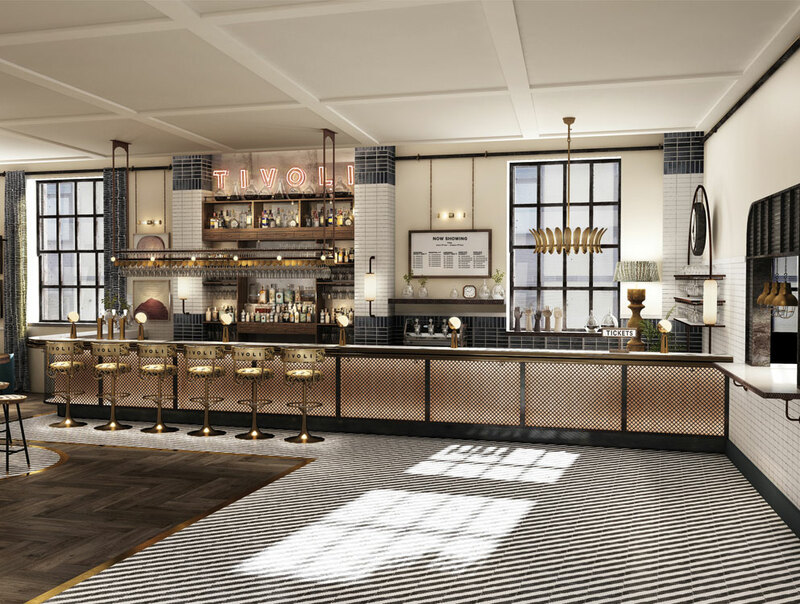 Many of the decorative lights were custom-designed to create an original style for Tivoli, with modern features harmonising with ‘old-world’ chandeliers, juxtaposed with industrial-chic fixtures, shapes and finishes. The interiors and graphics teams also worked closely to merge lighting and wayfinding throughout the space. The four ‘screening studios’ are small but opulently furnished cinema auditoria. In the initial concept phases, all four studios were envisioned with unique identities and colour schemes, sharing some core materiality, but having different fabrics to the seating and cushions. However, “after chatting it through with the client,” Burles explains, “we opted for a single colour scheme, for practicality and continuity.” The final palette combines two “very bold” shades that would tie the project together visually, as demonstrated on the deep sofas and armchairs which are upholstered in “a mix of deep, dark midnight blue velvet and burnished gold.” Fabrics and soft furnishings feature block colours, bold geometric patterns and pastels with ‘pops’ of bright colours with contrasting piping and trims. The velvet-clad two-person and single sofas are paired with cushions for extra comfort. Each sofa features a shelf on the back and is matched with a table for in-screen drinks and dining. 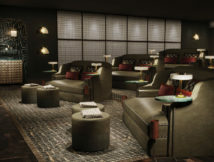 The sofas on the front row are paired with velvet and leather footstools. Ink-blue fabric-draped walls are lit with soft washes of light, and low-level bespoke table lamps add to the ambiance. “Rather than using wall lights in the studio rooms we’ve played with lighting ‘scallop’ effects over drapes,” says Burles. Run For The Hills designed a bespoke carpet, featuring a pattern derived from Tivoli’s logo. 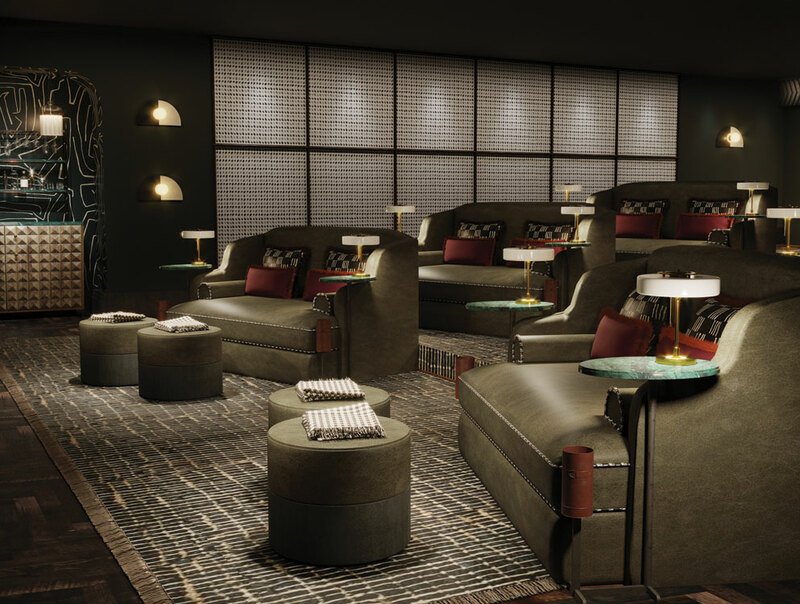 The twelve-seat Director’s Lounge has its own dedicated foyer and entrance, with a private adjoining hospitality lounge featuring leather sofas and an in-screen bar. Dark leather seating, geometric wall-fabric and upholstered wood panels feature throughout. The room is filled with custom joinery and brass accents, and each of the two-seater sofas is paired with footstools for ultimate visitor comfort. “We have worked hard to continuously develop and evolve the design for the space, and the finished article really reflects our original concept, and the ideas of the whole team behind it,” says Burles. A particular plus on this project for Run For The Hills was the opportunity to expand its horizons and work on a typology that they had never played with before. The project, now finished, opened its doors in December to greet its first customers with a screening of Mary Poppins Returns. Burles and her team are eagerly awaiting filmgoers’ reactions.